A group of SHG&A artists have come together to celebrate Day of the Dead. It’s only fitting that the tradition which was started by SHG&A artists continues. We as artists never waited for someone else to tell us when is the time to express ourselves before, surely we are not going to wait for a “prophet” or “miracle” to grant us the opportunity to create or exhibit now. This is how Self Help came into existence and Self Help artists are the ones who started Day of the Dead celebration in Los Angeles. This year as we have done for over 30 years, we WILL celebrate Day of the Dead again: on Wednesday Nov. 2nd we want to celebrate SELF HELP GRAPHICS & ART. No matter how you look at it, Self Help as we know it IS DEAD. It is with heavy heart that we finally accept the fact that we have to live with this reality. Now it’s time to celebrate a life that influenced so many. This announcement is being posted as a courtesy to other SHG&A artists. It is important to understand that we only want to celebrate Day of the Dead and this event is not meant to FORM a group or lead to some kind of organization. We just want to create and display our art. 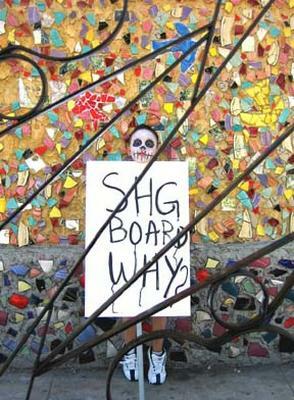 It is also important to emphasize that this event is NOT planned or organized by the Coalition of Concerned Artists and Citizens for Self-Help Graphics or the SHG Board. Any artists interested in participating please email your information to selfhelpartists@yahoo.com and you will be contacted with details. All other inquiries please use same email address.